When you use proper waist and knee power together while relaxed you will gain the benefits of whole body power. Start by first taking the waist and knee power exercises and doing them without any waist or knee movement and then do them with both the waist and knees acting in coordination at the same time. There should be a significant difference in power. Also, if you shift your body weight from one side to the other by shifting on your feet and then allow the weight to transfer into your pushing or pulling action then you will add another dimension to your power altogether. Trained properly you will find that this kind of training will give you powerful movement and striking ability while you are relaxed and moving relatively effortlessly. The trick to using this for self defense is to train fluidly and softly while maintaining the integrity of your body enough so that whatever action you are performing is done by your whole body as fast as you can move to do it. If you apply yourself to this training then you will find that the transference of body weight required to perform 1 Touch knockouts is something you can build into your movement so that whole body power is available whenever you need it. 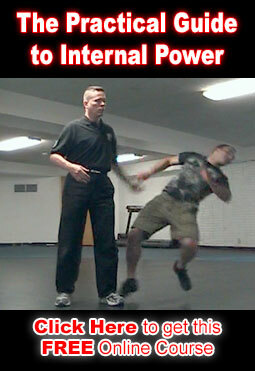 This kind of movement is essential for all of the advanced material in Clear’s Silat. Please send me any questions you may have. This knowledge is important in that developing fluidity and practicing with relaxation will map the neurology in your brain to perform the technique with lightning speed properly. If it is practiced at a slow and fluid pace in the beginning. After just a few months, with not a whole lot of practice, my strikes have become much more potent as a result of purchasing your 1 hit and 1 touch knockout videos. The Navy Seals are using the same techniques similar to the you are teaching with 1 Hit/touch knockouts I think. I just happened across an NBC blog about U. S. Navy Seals training this weekend training in Coronado. It was a field note by NBC correspondant Chris Jansing. In one exercise a Navy Seal was lying down on the ground with a hood on his head. His mock captures picked him up and pulled off the hood. The special forces soldier did rapid slaps to each soldiers face, striking them 3 times each across the pressure points. They both went down within 3 to 4 seconds. Another scenario: he is lying on the ground and two soldiers were leaning over him. The seal raised and fired off rapid palm strikes to each soldiers face dropping them in seconds. All of those contact meridians on the sides of the face ensured a quick knockout.Then the SEAL jumps up, pulls a pistol and blank shoots two guards at the door. The SEALS are using the techniques you are teaching in their self defense dude! Because it is effective and quick way to knock someone out.. It works! (there are three videos, views them all and get a glimpse into why this system is so effective the U.S. Navy seals are using it.